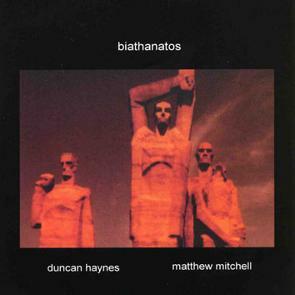 Biathanatos is an introspective musical conversation between two of the most unique voices that the New Zealand jazz fraternity has produced. This music is performed intuitively and is drawn from all of the diverse musical spheres which have shaped these two special musicians. They build and destroy musical structures with subtle intensity, seamlessly moulding improvised music forms, electronica, contemporary composition, Baltic and Balkan folk music and jazz into an engaging sound that is pure communication of human feelings and emotions.